A pleasant young man in his early 20s sat across from me. He had an engaging smile, although he didn’t smile often during our talk. What drew me in was the pain in his eyes. “Why wouldn’t you be worthy?” I asked. I suppose he thought I would be startled. I wasn’t. “And … ?” I inquired. This time I was relieved. “Thank you for wanting to deal with this,” I said. “It takes courage to talk about it, and I honor you for keeping yourself clean. He sat up a little straighter. I continued, “You serve yourself poorly when you identify yourself primarily by your sexual feelings. That isn’t your only characteristic, so don’t give it disproportionate attention. You are first and foremost a son of God, and He loves you. We talked for another 30 minutes or so. Knowing I could not be a personal counselor to him, I directed him to his local priesthood leaders. Then we parted. I thought I detected a look of hope in his eyes that had not been there before. Although he yet faced challenges to work through—or simply endure—I had a feeling he would handle them well. When an angel asked Nephi a question about God, Nephi answered, “I know that he loveth his children; nevertheless, I do not know the meaning of all things” (1 Nephi 11:17). I too affirm that God loves all His children and acknowledge that many questions, including some related to same-gender attraction, must await a future answer, perhaps in the next life. Unfortunately, some people believe they have all the answers now and declare their opinions far and wide. Fortunately, such people do not speak for The Church of Jesus Christ of Latter-day Saints. Although I believe members are eager to extend compassion to those different from themselves, it is human nature that when confronted with a situation we don’t understand, we tend to withdraw. This is particularly true of same-gender attraction. We have so little reliable information about it that those wanting to help are left feeling a bit unsteady. Admitting my own inadequacy in this regard but wanting to assist, let me offer some suggestions to help those who have loved ones or friends who are attracted to the same gender. First, let’s be absolutely clear on what God wants for each of us. He wants us to have all of the blessings of eternal life. He wants us to become like Him. To help us do that, He has given us a plan. This plan is based on eternal truths and is not altered according to the social trends of the day. At the heart of this plan is the begetting of children, one of the crucial reasons Adam and Eve left the Garden of Eden (see 2 Nephi 2:19–25; Moses 5:10–12). They were commanded to “be fruitful, and multiply” (Moses 2:28), and they chose to keep that commandment. We are to follow them in marrying and providing physical bodies for Heavenly Father’s spirit children. Obviously, a same-gender relationship is inconsistent with this plan. For various reasons, marriage and children are not immediately available to all. Perhaps no offer of marriage is forthcoming. Perhaps even after marriage there is an inability to have children. Or perhaps there is no present attraction to the opposite gender. Whatever the reason, God’s richest blessings will eventually be available to all of His children if they are clean and faithful. Through the exercise of faith, individual effort, and reliance upon the power of the Atonement, some may overcome same-gender attraction in mortality and marry. Others, however, may never be free of same-gender attraction in this life. As fellow Church members, families, and friends, we need to recognize that those attracted to the same gender face some unique restrictions regarding expression of their feelings. While same-gender attraction is real, there must be no physical expression of this attraction. The desire for physical gratification does not authorize immorality by anyone. Such feelings can be powerful, but they are never so strong as to deprive anyone of the freedom to choose worthy conduct. In saying this, let me make it clear that attractions alone, troublesome as they may be, do not make one unworthy. 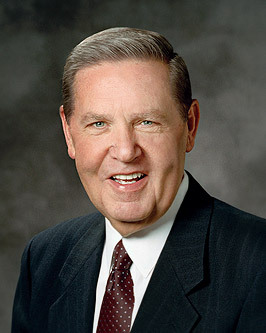 The First Presidency has stated, “There is a distinction between immoral thoughts and feelings and participating in either immoral heterosexual or any homosexual behavior.”2 If you do not act on temptations, you have not transgressed. The failure to see that distinction sometimes leads to despair. I ache for those who do not understand that every blessing offered by God is available to anyone who obeys the laws upon which those blessings are predicated (see D&C 130:20–21). No one who lives the gospel should despair. Hope and peace come from the Comforter, and the answer to despair is to invite the Holy Ghost into our lives. Let’s assume you are the family member or friend of someone with same-gender attraction who comes to you for help. What do you say? What do you do? I’d begin by recognizing the courage that brought your son, daughter, sibling, or friend to you. I’d recognize the trust that person has extended. Discussing the issue with someone of trust is a healthy first step to dealing with confusing feelings, and it is imperative that these first steps be met with compassion. Next, if you are a parent of one with same-gender attraction, don’t assume you are the reason for those feelings. No one, including the one struggling, should try to shoulder blame. Nor should anyone place blame on another—including God. Walk by faith, and help your loved one deal the best he or she can with this challenge. In doing so, recognize that marriage is not an all-purpose solution. Same-gender attractions run deep, and trying to force a heterosexual relationship is not likely to change them. We are all thrilled when some who struggle with these feelings are able to marry, raise children, and achieve family happiness. But other attempts have resulted in broken hearts and broken homes. Above all, keep your lines of communication open. Open communication between parents and children is a clear expression of love, and pure love, generously expressed, can transform family ties. But love for a family member does not extend to condoning unrighteous behavior. Your children are welcome to stay in your home, of course, but you have every right to exclude from your dwelling any behavior that offends the Spirit of the Lord. Next, consider a principle learned in gardening. Someone said that if we plant a garden with good seed, there will not be so much need of the hoe. Likewise, if we fill our lives with spiritual nourishment, we can more easily gain control over inclinations. This means creating a positive environment in our homes in which the Spirit is abundantly evident. A positive environment includes consistent private and public worship, prayer, fasting, scripture reading, service, and exposure to uplifting conversation, music, literature, and other media. I weep with admiration and respect at the faith and courage of such a man who is living with a challenge I have never faced. I love him and the thousands like him, male or female, who “fight the good fight” (1 Timothy 6:12). I commend his attitude to all who struggle with—or who are helping others who struggle with—same-gender attraction.